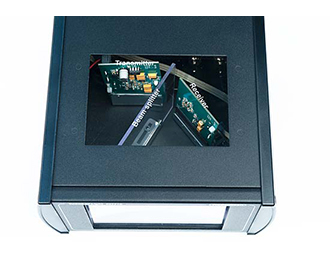 The Pulse-emitter box and retro-reflective screen shown in use with a meter stick and oscilloscope (not included). 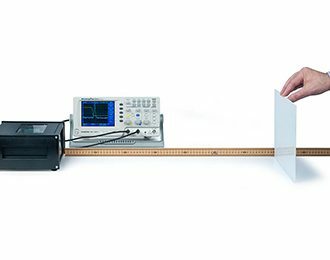 To measure the speed of light, pulsed light is reflected off of a retro-reflector and the time between the pulse and the received reflection is measured with an oscilloscope. The progressive delaying of light pulses is observed as they travel farther and farther. Very short but powerful pulses of light are emitted from the box. When the light pulses hit the special retro-reflective foil of the reflector, they are directed back toward the source with no need for tedious adjustments. 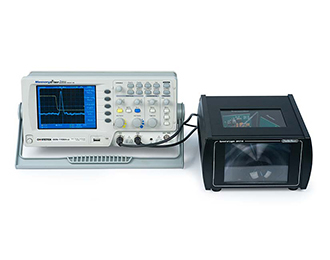 The returning light pulses pass through a beam-splitter and strike a high-speed photodiode, converting the light pulses into electric pulses that are displayed on an oscilloscope. A separate synchronization signal marks the time of pulse emission, so time between emission and return can be timed. The distance to the retro-reflector is increased a known distance and the resulting increase in return time allows the speed of light to be calculated by simply dividing the distance by the change in time.